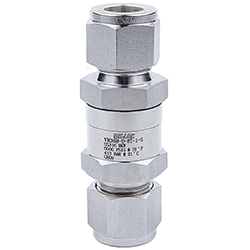 VH36 Series High Pressure Check Valves / VCH36 Series CNG/NGV Check Valves operate to 6,000 PSI with a blowout proof bonded poppet seal. Seal materials are Viton (standard), HNBR (CNG) with optional EPDM and Kalrez to meet your application requirements. Sour Gas option to meet NACE MR0175. The CNG version carries ECE R110, ANSI / AGA NGV 3.1-1995/CGV NGV 12.3-M95, and ISO 15500 certification. Spring strengths; 1/3#, 1#, 5#, 10# and 25#. Contact your local DK-LOK® representative for more information.